Back in January we introduced Cris, a member of the 2016-2017 PatientsLikeMe Team of Advisors living with ALS. She’s also a fierce patient advocate who’s participated in several clinical trials since her diagnosis. We recently caught up with her to learn about her experience with clinical trials and why access and awareness of clinical trials is so important. Despite her shy personality, Cris got involved with patient advocacy with the encouragement of her ALS specialist, Dr. Richard Bedlack. Determined to overcome her shyness, Cris found motivation and purpose in advocating for future patients, family and friends and the belief that access to all trials should be easily available for a patient and not complicated to locate. 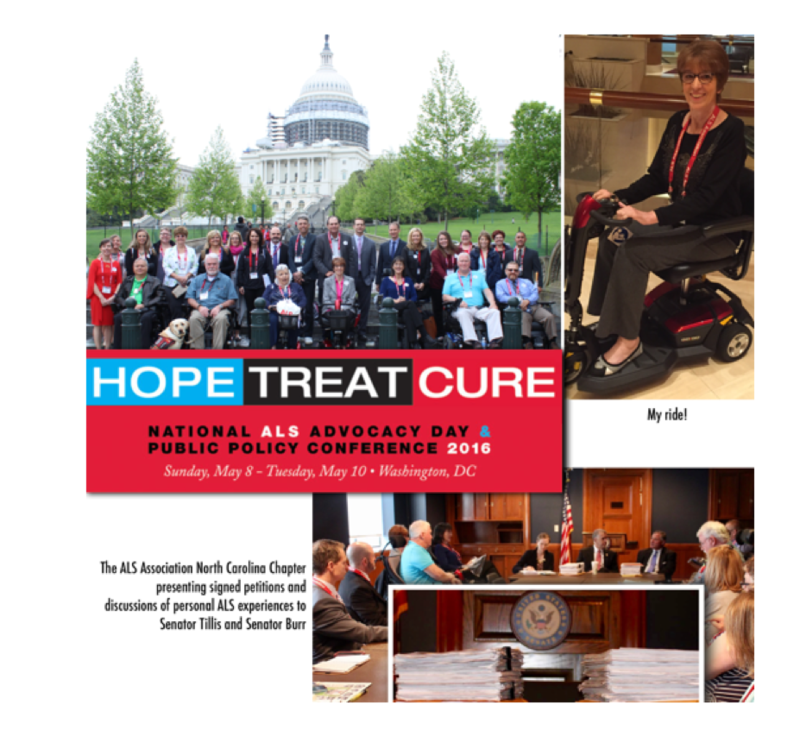 In May, she attended the ALS Advocacy Day in Washington D.C., where she represented pALS from North Carolina and shared her own ALS journey with her state’s senators. Cris believes that clinical trials are critical for survival, present and future, but physicians don’t know about, or take the time to discuss current trials with patients unless their facility is active in research. There are very few active ALS clinical trials and because of stringent trial protocols, many patients are not accepted due to progression of the disease. She believes that since ALS is fatal, drug companies are worried patients might succumb before end of trial. Started a new trial but ultimately failed in the qualification process. Started a “blind” (placebo vs drug dosage) – but couldn’t tolerate the side effects of the drug dosage and was advised not to continue. Participated in a monitored daily physical activity study. Currently enrolled in the year-long Lunasin Virtual Trial (completing at the end of March 2017). This trial is in partnership with Duke and PatientsLikeMe and all monthly input and results can be viewed by PatientsLikeMe patients. Currently participating in a 6-month study through the Precision Medicine Program (ALSTDI), to compare movement data collected using accelerometers and overlay those data with an individual’s self-reported ALSFRS-R scores. Involves keeping track of progression with activity monitors for six days. What is the goal of the Duke Lunasin Virtual Trial? The primary hypothesis is that a supplement regimen containing Lunasin can decrease the rate of ALSFRS-S progression by 50% relative to matched historic controls. While it might not be the most delicious drink, Cris makes it work by mixing the Lunasin with juices or smoothies. Cris, like many of her fellow pALS, is willing to go to any length for a treatment or cure. Want to know more about the Duke trial? Check out what Dr. Bedlack had to say. Cris shared about Lunasin and being a part of the Duke trial. With 151 PatientsLikeMe members reporting that they’ve used Lunasin to treat their ALS, 140 treatment evaluations and almost 45,000 forum posts, Lunasin is a popular topic in the ALS community. Want to learn more? Head to the forum to check what people are saying about Lunasin.